As Congress debates the future of health care in America, it is helpful first to consider Obamacare’s failings, and then look to the reforms needed to not just replace the law, but make the health care system better for all. Health policy experts argue that the main problem with Obamacare is that it took a flawed health care system burdened with too much government intervention, in the form of regulation and dollars, and doubled down on it. The individual mandate, which went into effect in January 2014, requires all Americans to have ACA-compliant health insurance or face an annual fine, which has been going up each year. In 2016, it was a minimum of $695 per adult and $347.50 for children, or 2.5 percent of a household’s income, whichever is greater. Therefore, a family of four would owe $2,085 at a minimum. Using the 2.5 percent figure, for an individual earning $50,000 per year, the penalty would be $1,250. The fee must be paid in full if the lapse in coverage was two full months or more, half if less than that time period. The employer mandate, which went into effect in 2015, requires all businesses with 50 or more people to provide ACA-compliant insurance to their full-time employees (30 or more hours per week) or pay an annual fee of $2,000 per full-time employee not covered. Obamacare expanded those eligible for free government health care under Medicaid to those earning 138 percent of the federal poverty level. For 2017, the threshold is about $16,600 for individuals and $33,900 for a family of four. In 2012, the Supreme Court ruled that the federal government mandating the states to expand Medicaid (which is a shared federal/state program) is unconstitutional. Thirty-two states, including the District of Columbia, have expanded their programs and 19 have not. Former President Barack Obama, in selling the increased role of the federal government in health care — which accounts for 20 percent of the American economy — promised Americans that those who currently had health care plans would not be affected by the new law. “If you like your health care plan, you can keep it,” Obama pledged on multiple occasions before and after the bill’s passage. Politifact named this promise the “Lie of the Year” in 2013, as over 4 million cancellation letters went out to policy holders that year, and such letters continued in the years thereafter. The reason for the millions of cancellations was the mandated coverage requirements of Obamacare — essential health benefits — that forced insurers to cancel the policies in order to be compliant. Essential health benefits include coverage that some consumers may not want or ever need, including maternity and newborn care, mental health and addiction treatment, prescription drugs, preventive services (including the contraception mandate) and pediatric services. Not surprisingly, each additional coverage health insurance providers must include in their policies drives up the costs. In the individual market, the average nationwide premium increase has been 99 percent for individuals and 140 percent for families from 2013-2017, according to an eHealth report. “This has only limited patients’ choices: Most people have few options among health insurance plans, and those plans dictate where we receive care through limited provider networks,” she said. According to the Heritage Foundation, 70 percent of U.S. counties have only one or two insurers offering coverage through the Obamacare exchange. Some areas of the country face having no insurers on the exchange at all in 2018, according to Bloomberg. Both Manning and Cannon agree that if the goal is to bring true reform to the health care system, the answer is going to have to be less government control and a more free-market economy. “A better policy would be one that entrusts individuals and families with the freedom to choose coverage that’s right for them, without forcing them to buy a one-size-fits-all policy,” Manning said. “Congress needs to enact reforms that make health care more affordable, rather than just subsidize unaffordable care,” Cannon contended. 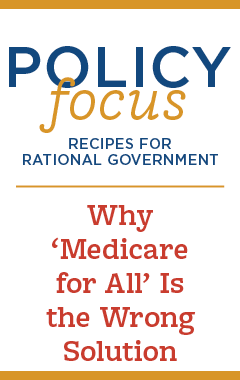 “To make health insurance more affordable, Congress should free consumers and employers to purchase health insurance licensed by states other than their own.” This would create a nationwide market, creating a far greater pool of people, instead of 50 tightly regulated smaller markets. Cannon also said Congress should significantly increase the cap on Health Savings Accounts as a means to create more competition in the health care market. Currently the amount of tax-free dollars employers and employees can contribute to health savings accounts is $3,400 for individuals and $6,750 for a family. Sen. Jeff Flake, R-Ariz., and Rep. David Brat, R-Va., introduced legislation in 2016, based on Cato’s recommendation, to create “Large HSAs,” increasing the limits to $9,000 and $18,000, respectively. The legislation “would allow tax-free HSA funds to purchase health insurance, over-the-counter medications and direct primary care. It would eliminate the mandate that HSA holders purchase a government-designed high-deductible health plan,” explained Cannon. The Large HSAs would empower employees to opt for going into the marketplace and purchasing the insurance that is best for them rather than what is simply offered by the employer. By decoupling people’s insurance plans directly from their employers, it would also address the issue of pre-existing conditions for many, because they would be able to maintain continuous coverage, even if they changed jobs. “The health care system, such as it is, serves the needs of people other than the consumers who it is supposed to serve,” said Cannon. Congress has the opportunity, with Obamacare’s many failings, to institute true reform that Americans can cheer for years to come.